The Dexter 2022 fish knife is designed with a 4-inch high-carbon steel blade that is individually ground and honed for precise sharpness. 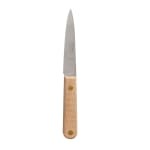 It features a natural beech wood handle that is scored, providing a texture that makes Dexter 2022 fish knife's handle easy to grip. The handle is attached to the blade with brass compression rivets that expand and contract with the wood, keeping the handle secure.